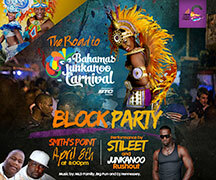 The Grand Bahama Junkanoo Carnival Weekend is about to go down and the lineup is CRAZY!! Taino Beach has been transformed into "Da Cultural Village" and there is something for everyone. 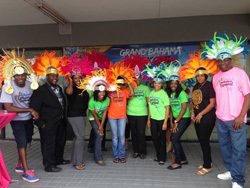 The time has arrived for the Grand Bahama Junkanoo Carnival Kickoff Weekend! Taino Beach has been transformed into "Da Cultural Village" and there is something for everyone. A Liberty City, Miami, based Social Worker and his wife, will travel to Grand Bahama with Hot 105 FM’s Radio Personality, “James T” this weekend to enjoy the festivities, excitement and celebrations of the first ever Bahamas Junkanoo Carnival. The BJC committee met at Worker’s House over the weekend with team leaders and their workers, vendors, volunteers, Junkanooers,fitness instructors,artists,DJs and local performers to finalize plans for the Taino Beach site which is being transformed into a Cultural Village. 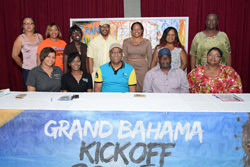 Beach activities coordinator for Bahamas Junkanoo Carnival Shorrell Dames says Grand Bahama is ready to pave the road to Nassau as exciting and creative activities are planned to bring in the electrifying inaugural event. 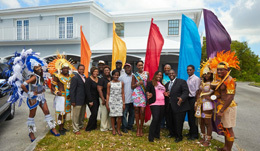 “Specifically in Grand Bahama, we are looking forward to culture, music and community. It’s a fun, family, friend-filled event with so many things to do,” she said recently. FREEPORT, Grand Bahama -- Activities surrounding Bahamas Junkanoo Carnival are expected to generate a 3-1 return on the initial investment, said Minister for Grand Bahama, the Hon. 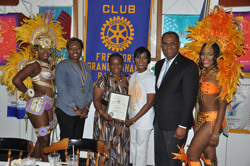 Dr. Michael Darville, during the monthly meeting of the Rotary Club of Freeport on Thursday. 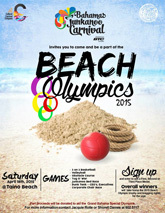 Activities have already begun in various communities around the island, creating hype for the inaugural festival to be held at Taino Beach on April 17 and 18 with semi finals, and the grand festival, Road Fever, scheduled for Nassau on May, 9. 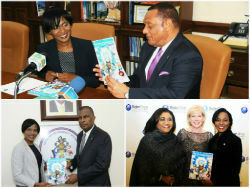 According to Minister Darville, "We have been dying in Grand Bahama..."
As the road to Bahamas Junkanoo Carnival Kick Off Weekend in Grand Bahama draws near, organizers are pooling all of their resources to pull off an explosive two-day event come April 17th and 18th, 2015 at Taino Beach, which includes the Music Masters Semi-finals Concert and a beach party. 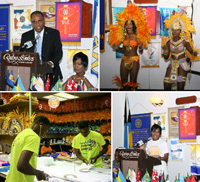 EIGHT MILE ROCK, Grand Bahama -- Bahamas Junkanoo Carnival Eight Mile Rock kicked off at the Eight Mile Rock Fish Fry, Thursday. In attendance were Minister of Grand Bahama the Hon. 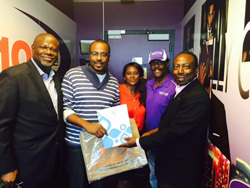 Dr. Michael Darville, Senator Tanisha Tynes, Freeport City Councilor Clifton Francis, and Entrepreneur Ginger Moxey. The Bahamas National Festival Commission (BNFC) remains committed to its mandate to create events that will stimulate sustainable cultural industries and promote all things Bahamian. 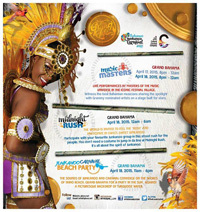 Freeport, Grand Bahama Island - April 17-18, 2015 all roads lead to Taino Beach for an action packed weekend of culture and entertainment as Grand Bahama kicks off the Bahamas Junkanoo Carnival party featuring T - Connection and J Mitchell live in concert. Enjoy one epic weekend of non-stop cultural activity inside Da Cultural Village. Jump in Da Line with Bahamas Junkanoo Carnival: A Celebration of Community and Culture. Also present at the conference was the Hon. Fred Mitchell, Minister of Foreign Affairs. Bahamas National Festival Commission consultant Ginger Moxey earlier discussed the economic opportunities and benefits of the event for Grand Bahama Island. The Grand Bahama Cultural Carnival Company is the official carnival company for the sale of costumes and related carnival supplies for the Freeport launch of Bahamas Junkanoo Carnival set to take place April 17th and 18th.